Complex structures in the sandstones of the Lower Jurassic aeolian Clarens Formation (Karoo Supergroup) are found at numerous localities throughout southern Africa, and can be assigned to five distinct architectural groups: (1) up to 3.3-m high, free-standing, slab-shaped forms of bioturbated sandstones with elliptical bases, orientated buttresses and an interconnecting large burrow system; (2) up to 1.2-m high, free-standing, irregular forms of bioturbated sandstones with 2-cm to 4-cm thick, massive walls, empty chambers and vertical shafts; (3) about 0.15-m to 0.25-m high, mainly bulbous, multiple forms with thin walls (<2 cm), hollow chambers with internal pillars and bridges; (4) about 0.15-m to 0.2-m (maximum 1-m) high, free-standing forms of aggregated solitary spheres associated with massive horizontal, orientated capsules or tubes, and meniscate tubes; and (5) about 5 cm in diameter, ovoid forms with weak internal shelving in a close-fitting cavity. Based on size, wall thickness, orientation and the presence of internal chambers, these complex structures are tentatively interpreted as ichnofossils of an Early Jurassic social organism; the different architectures are reflective of the different behaviours of more than one species, the history of structural change in architectural forms (ontogenetic series) or an architectural adaptation to local palaeoclimatic variability. While exact modern equivalents are unknown, some of these ichnofossils are comparable to nests (or parts of nests) constructed by extant termites, and thus these Jurassic structures are very tentatively interpreted here as having been made by a soil-dwelling social organism, probably of termite origin. This southern African discovery, along with reported Triassic and Jurassic termite ichnofossils from North America, supports previous hypotheses that sociality in insects, particularity in termites, likely evolved prior to the Pangea breakup in the Early Mesozoic. Group 1 (Figs 2a and 3a) are large (up to 3.3 m), laterally-flattened sandstone pillars with strong northsouth orientation, with or without side buttresses. Group 2 (Figs 2b and 3b) are more irregular pillars of larger diameters (up to 1 m), but smaller vertical dimensions (up to 1.2 m) than those in Group 1. In addition, Group 2 pillars have thick, massive walls and a series of empty chambers and shafts in their interior. Associated with the sandstone pillars of both Groups 1 and 2, tubes with meniscate fill (average diameter 2 cm) have also been observed. It is noteworthy that Group 1 and 2 forms are preserved poorly in the main Karoo Basin due to enhanced weathering, compared to the present day more arid Tuli Basin which lies more than 500 km to the north. At Site 1 (Fig. 1), 53 Group 1 pillar orientations have a mean vector of 359.22º, comparing favourably with the mean orientation of 357.39º in 153 analogous pillars in the Tuli Basin as well as with the orientation of recent northern Australian termite nests.7 Group 2 structures (Sites 1 and 6) in the present study area have a network of large, anastomosed, hollow tunnels, 520 cm in diameter (Fig. 2c) that seem to be underlying the free-standing nests and are occasionally subhorizontal. 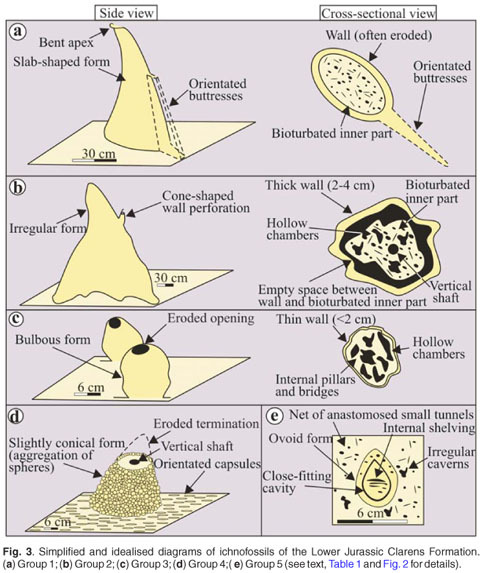 These anastomosed tunnel walls are 2.53.5 cm thick, and have a smooth exterior and locally bioturbated inner surface. The individual tunnels have a fairly constant diameter. Group 3 ichnofossils (Figs 2d and 3c) are distinguished from Group 2 structures based on differences in internal morphology and bulbous external shape. Group 3 forms are shorter (average 1525 cm) and have thinner walls (less than 2 cm, Fig. 2d) with a rough, sugary interior surface, lining highly irregular cavities. The cavities are hollow, but rare, broad, upward-tapering 'props' (less than 10 cm high) and irregular bridges (12 cm wide) may be preserved within them (Fig. 2e). Horizontal and subhorizontal hollow cylinders with external diameters (46 cm) are also associated with these cavities (for example, Sites 3 and 4). Group 4 ichnofossils are an association of spheres (0.54 cm) and horizontally-orientated capsules (0.5 cm in diameter and 15 cm in length), and usually are exposed in ~20 m2 horizontal surfaces (Fig. 2f; see Bordy21 for details). Locally, small (1520 cm high and 2030 cm wide) columns of the small spheres emerge from the surface where the abundance of solitary and coalesced spheres is highest (Figs 2g and 3d). These columns have a partially-filled shaft in their interior. Locally, smooth-walled, horizontal tubes, 8 cm in diameter, extend laterally from the upright columns and are filled with sandstone bioturbated by a network of interconnected, fine galleries of 0.20.3 cm in diameter. At Site 1, part of a larger columnar structure, consisting entirely of spheres of various sizes, is 1 m tall and 1.7 m wide. The spheres within the 'wall' were sorted neatly from the larger (3 cm to 4 cm diameter) spheres on the outer edge (Fig. 2h), to smaller (about 0.5 cm diameter) spheres on the inner edge. Intermediate-sized spheres occupy the central portions of the 'wall'. The surface, from which this 'wall' remnant protrudes, is covered by parallel, strongly northsouth oriented, semi-connected capsules and tubes (about 0.5 cm in diameter), resembling an oriented, semi-connected tunnel system cast in sandstone (Fig. 3d). Surfaces identical to this, and with an approximate northsouth orientation, were also observed in Tuli Basin, at Site 3 (main Karoo Basin) and numerous other localities in South Africa where they co-occur with meniscate tubes (the latter having a uniform diameter of 1 cm) and other probable ichnofossils (see Bordy22 for details). Group 5 ichnofossils were observed in eroded vertical surfaces showing an egg-shaped chamber (maximum diameter of 5cm) with poorly-developed internal shelving in a close-fitting cavity (Figs 2i and 3e). This oval form is associated with 34 cm diameter irregular caverns, and a multitude of small, circular openings 0.3 to 0.5 cm in diameter, forming a contorted, interconnected passage system within the sandstone matrix. Many organisms disturb the soil, on large and small scales. 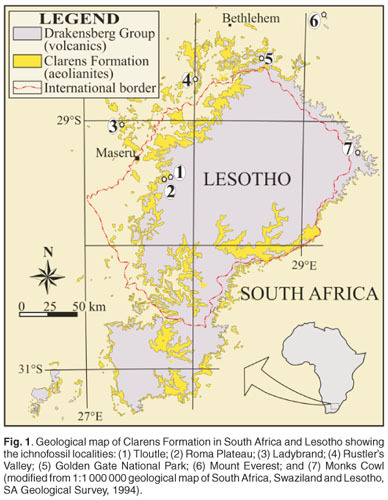 The Clarens Formation structures described here may have several different origins. Those that show a defined concentration of intense bioturbation in an otherwise undisturbed (bedded) sandstone are suggestive of traces of soil-dwelling life forms, most probably of social organisation. Among modern organisms, some termites construct very similar, but not identical, nests to the architectural features of these Early Jurassic structures. Details on the similarities of the elaborate large pillars of Groups 1 and 2 to modern termite nests, and, in the case of Group 1, their resemblance to the magnetic mounds of Australia (Termitidae), are discussed in Bordy et al.7. Here we also consider that certain, especially the more primitive termites, are wood inhabitants,23 and thus it is possible that the pillar-shaped occurrences of Group 2, and the network of large, anastomosed, hollow tunnels and horizontal components of the structures associated with Groups 2 and 3 (Figs 2a and 2c), are possibly remains of termite-infested wood especially when considering that fossil tree stumps in the Clarens Formation are present both in South Africa and Lesotho.2426 If these structures were associated with wood-inhabiting termite species, the pillar-like sections (i.e. the tree stumps) probably were occupied as the main nest, and the radiating anastomosed and (semi-)horizontal tunnels formed part of the termite-infested tree root system. Alternatively, the larger horizontal and semi-horizontal tunnels may be interpreted as subterranean passageways or burrow systems, which probably were used for interconnecting adjacent, related nests or calies (as described by Noirot and Darlington27 for modern termites and by Direnger et al.2 in Miocene fossil termites), even though the size differences are apparent. It has to be emphasised that, other than the overall shape or external morphology, any direct evidence to substantiate the above interpretations is absent. Furthermore, resemblance in the external morphology between Group 3 forms and modern nests of Odontotermes latericius is also present to some degree; however, these seem to differ internally as the cross-sectional exposures of the Group 3 structures lack the preservation of any centralised nest cavity, which is an integral part of the nest of the modern taxon. There is also some resemblance in the external morphology of the structures built by the modern harvester termites (Hodotermitidae) in South Africa28 and the semi-spherical chamber with horizontal galleries (internal shelving) of Group 5. However, the diagnostic horizontal shelving of the hive is not very well-preserved in our case, probably partially due to the coarse nature of the host sediment and weathering. Furthermore, the size differences are also notable, though it is possible that our structure represents small hives. Unquestionably, and partly due to the fact that the very nature of trace fossils in general poses difficulties in their interpretation, the Clarens structures cannot be assigned unequivocally to termite origin, in contrast to more recent termite ichnofossils,2,29 largely because these Early Jurassic structures may have been modified over time by diagenetic, thermal, and more recently, surficial weathering processes. More specifically, the differences van Eeden.31 While such an alteration effect of Karoo dolerites is in their structure and that of other more easily defined, younger commonly responsible for the formation of random concretions termite ichnofossils, may be attributed to the hydrothermal in the host sediments (which locally are rather abundant in the alteration effect associated with the intrusion of post-Clarens Clarens Formation, Fig. 4. 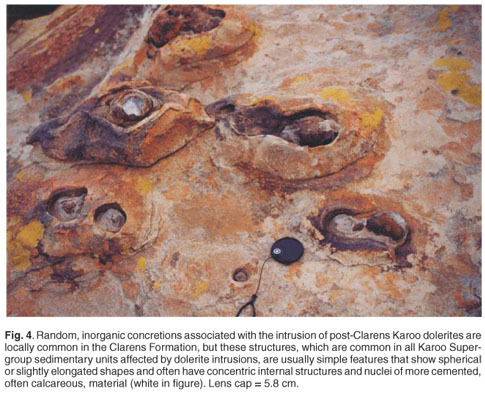 ), it is unlikely that such magmatic Karoo dolerites, an idea originally suggested by de Villiers30 and processes resulted in the consistent shape and orientation, the intricate burrows systems, the back-filled traces, etc. associated with the currently-described structures. Although it is difficult to quantify the altering effect of such post-depositional processes, it is possible that they, at least partly, may have cemented, consolidated and overprinted the original structures by blurring or even destroying some of the more delicate biogenic features, but enhancing the preservation of the overall forms. Taking the above into account, we propose that the trace makers of the Clarens trace fossils are either some unknown Jurassic social organisms or Jurassic precursors of modern termites (for example, an Early Jurassic ancestor later leading to both Isoptera and their closest relative, the cockroach family (Cryptocercidae)). It needs to be emphasised that, in spite of current termite phylogeny indicating that the nascent stages of termite evolution were only in the Late Jurassic (see Grimaldi and Engel22 for review), the large time gap (>50 Mya) in the fossil record between the earliest-known body fossils of Isoptera (from the Early Cretaceous  Berriasian of Russia33) and the Late Triassic ichnofossils interpreted as the first putative termite trace fossils,4,16 in our view, does not preclude the possible existence of termite-like organisms (or termite ancestors) in the Early Jurassic.34 However, to date, apart from the overall architectural and size similarities between these trace fossils and modern termite nests, there is no other strong support for the true termite origin of the structures, and thus their attribution to termites is tentative at this stage. If accepting that the resemblance of the Clarens ichnofossils to modern-day termite nests is sufficient evidence to tentatively identify them as possible fossil termite nests, their interpretation as components of concentrated nests conforms to the nomenclature based on Noirot35 and Roonwal36 and summarised by Hasiotis.6 The nomenclature was easily applicable to ichnofossils belonging to Groups 2 and 5, but proved difficult for Groups 1, 3 and 4 (Table 1). The practicality of the above terminology is illustrated by the various Group 5 ichnofossils, where the ovoid chamber subdivided by shelves into a series of compartments can be interpreted as a hive within a nest, or endoecie. The irregular caverns can be interpreted as chambers for royals, and the interconnected passages as galleries of the periecie. Due to the high diversity of ichnofossil forms, however, the abovementioned terminology was not always applicable. Its rigid application would have resulted in the overlooking of previously undescribed nest forms or associations. For example, even though the enigmatic features of Group 4 do not resemble any known termite architecture, because the architectural forms in this Group 4 occur in a strict association defining a complex structure (e.g. occasional free-standing pillars floored by bioturbated horizontal surfaces), they can be interpreted as parts of a unique fossil termite nest with infrequently preserved epigeous nests and better preserved subterranean sections. Additionally, bioturbated masses characteristic of Group 17 may be identified as either the endoecie or periecie (based on the terminology of Hasiotis6), but the network of larger, anastomosed burrows associated with Group 1 architecture remains unnamed at this stage. It is unlikely that the five structural groups from the Early Jurassic of the main Karoo Basin have an inorganic origin, given their structural variety, complexity, occasional systematic orientation, association with back-filled and massive trace fossils,22 and repeatability in different areas of southern Africa. In addition, large structures such as these cannot be built by solitary insects. 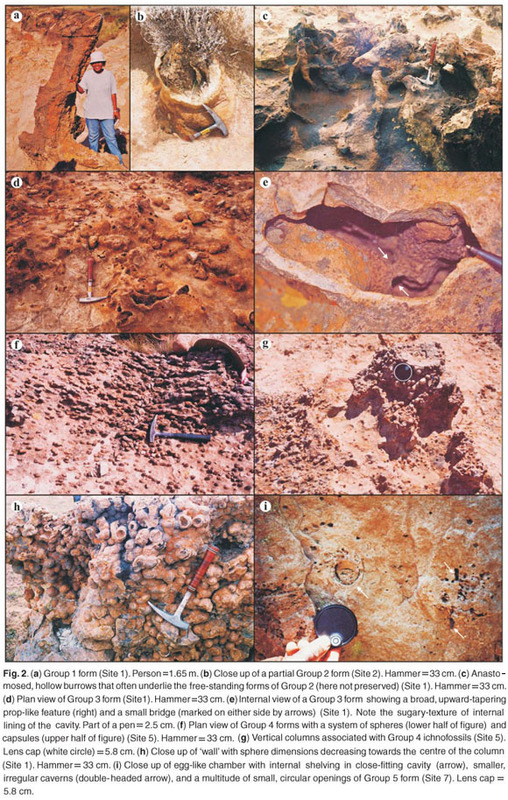 Based on arguments presented here, it seems reasonable to conclude that the Clarens Formation ichnofossils may be products of a soil-dwelling, social organism that behaved similarly to modern termites (e.g. obtained their building matter by mixing their excrement with sediment particles), and left behind bioturbation features that closely resemble, in many aspects, modern termite nests. To date, the documented trace fossil assemblages from the Early Jurassic geological record of southern Africa preserves both simple3,22 and a range of elaborate forms7,26 that have been assigned to social organisms either of unknown origin or related to termites. Worldwide, certain Mesozoic ichnofossils have been attributed to termite activity;46,8,15,3739 however, some researchers1 question any pre-Cretaceous termite ichnofossil interpretations. Indisputably, in our case, literal correspondence with any modern termite nest type is lacking, and not all architectural forms can be fully interpreted in terms of modern termite behaviour (especially Group 4). Reasons for this may be that these Early Jurassic ichnofossils were altered in the past 200 million years, or that they represent a nest structure not reproduced by modern termites. In other words, they may represent activities of a precursor of termites or an extinct social organism that was not related to termites, but behaved similarly to them. The latter is unlikely because no evidence to date suggests that anything other than termites could have been responsible for similar structures. Sedimentological and palaeontological evidence, associated with the diverse trace fossil forms in the uppermost part of the Clarens Formation, suggests the Early Jurassic of southern Africa was not excessively and uniformly arid.19,25,41 In particular, dinosaur footprints and plant fossils (e.g. petrified gymnosperm wood with well-developed growth rings24,25), as well as ephemeral stream deposits located along the same stratigraphic horizon in the main Karoo Basin, demonstrate the onset of a more humid phase in the Early Jurassic climatic history of southern Africa. Evidence of a relatively wet climatic condition is also abundant from the sedimentary interbeds from the lower part of the overlying, predominantly volcanic Drakensberg Group. These include carbonised plant matter, arthropod and insect fossils, fossil footprints and ephemeral fluvial-lacustrine deposits25,42 (also own observations). In addition, up to 30-m thick pillow basalt and interbedded sub-aqueous sedimentary strata in the lower part of the Drakensberg Group43 (also J. Marsh, pers. comm. and own observations) also indicate a relatively humid climate with fairly common standing bodies of water in this part of Pangaea in the Early Jurassic. The abovementioned evidence of wet period(s) depicts an environment that was not overly harsh and could have provided sufficient organic matter needed by the widely-distributed colonies of these social organisms during Clarens times. In view of the relative abundance of gymnosperm wood in the Clarens Formation, as well as a recent report indicating that mutualistic associations between termites and protozoa are at least 100 million years old,44 it is possible that the trace makers were wood feeders and their digestion might have been assisted by microbial symbionts (e.g. protozoa or bacteria). Considering that in extant species of termites (e.g. Macrotermes bellicosus), nest architecture is dependent on ambient tempera-ture,40 the architectural style of these supposed nests could hint at local microclimate conditions. According to Korb,40 thin-walled epigeous nests with ornate, ridged outer walls are constructed in warm temperatures where the need for insulation is low. Thin walls also allow for enhanced gas exchange, minimising CO2 levels within the nest, and optimising fungus-growing conditions. In areas where ambient temperature is lower (perhaps due to canopy shading or more vegetated interdune areas), epigeous nest walls are thicker for insulation, at the expense of reduced gas exchange.40 Differences in wall thickness between the coeval Groups 2 (thick walled) and 3 (thin walled), may therefore signal differences in local ambient palaeotemperatures due to variable microclimatic conditions. Structural architecture, and thus, nest constructional behaviour of the Jurassic social organism, may then reflect environmental variation, rather than species behaviour alone. Alternatively, these structures, especially where they co-occur (as in Sites 1 and 4), may represent age differences of colonies of the same species (i.e. an ontogentic series), however their relative ages are difficult to assess due to lack of stratigraphic markers and other age indicators; apparent co-occurrence may be a product of modern weathering. The discovery of these diverse terrestrial ichnofossils in Gondwana and southern Pangea, and their attribution to social insects, probably termites, is highly relevant to the ongoing debate1,34 about the timing of the origin of termites as well as social behaviour in insects. The interpretation that termites might have been the possible makers of these intricate structures further corroborates the idea that sociality in insects evolved prior to the breakup of Pangea, in the early Mesozoic.913,18 Thus, these current southern African findings, as well as the previously reported early to mid-Mesozoic termite ichnofossil occurrences,4,6,7 challenge some current thinking about the late Mesozoic evolutionary origin of termites as social insects. Moreover, the discovery of Fruitafossor windscheffelia, a fossil mammal from the Late Jurassic,45 which had specialised dentition for a termite-and other insect-based diet, corroborates the presence of pre-Cretaceous termites. The great variability of the ichnofossils presented here mirrors the behavioural complexity of their builders, and potentially suggests that highly social superorganisms, consisting of a multitude of individuals with coordinated activities, were present in the Early Jurassic of southern Gondwana. Considering that ichnofossils of termite nests have already been hypothesised from the Late Triassic and Late Jurassic4,6,8 of North America, these recent findings reveal that termites may have been wide ranging in Pangea in the early and mid-Mesozoic and thus could have evolved and radiated before the breakup of the supercontinent. E.M.B. was a South African National Research Fund postdoctoral fellow during the initial stages of manuscript preparation, and has received JRC funds from Rhodes University. O.C. thanks the University of Alberta and Natural Sciences and Engineering Research Council of Canada for research support. A.J.B. and P.G.E. thank the University of Pretoria for research funding. Thanks to D. Ambrose, B.S. Rubidge, P. Jacklyn, V. Uys, S. Masters, M. Diop, the ladies of the Nhlapo family and L. Ntsaba for their scientific or field support. We also thank two anonymous reviewers and A. Morris for constructive review of the manuscript. The investigation complies with the current laws of the countries in which it was performed. Received 30 January. Accepted 10 July 2009.